A young Christian fundamentalist disrupts life at his school. We live in an age in which anti-intellectualism is worryingly on the rise. Experts are untrusted. Educated people are mocked as 'elitists' and viewed with suspicion. Established facts are forced to battle with 'alternative facts'. Much of this can be put down to the growing influence of religion, and an increased tolerance in the public sphere for its unfounded and anti-scientific beliefs (take a shot of vodka every time Trump mentions God in his inauguration speech and you'll pass out in minutes). Those who deny climate change, evolution and the fact that a stem cell is not a human are given creedence by a system that allows such ideas a place alongside tangible truths. Nowhere does this cause more conflict than in the classroom, with children taught the opposing ideas that we're all descended either from apes or from Adam and Eve. Laughable as it may seem, many choose to believe the latter. 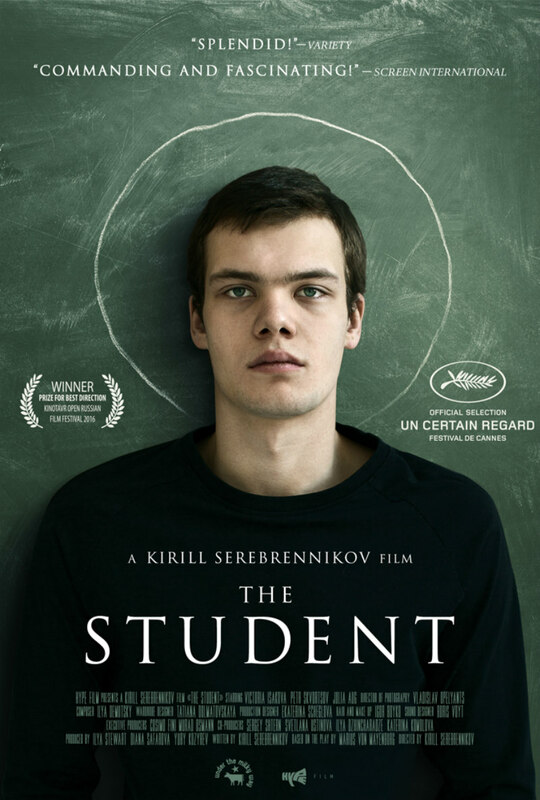 That's the case with the angry young man at the centre of Kirill Serebrennikov's rivetting Russian drama, The Student. Venya (Pyotr Skvortsov) has recently discovered The Bible, learning its text off by heart and considering it his ultimate moral compass. For every scenario and argument he faces, he has a fire and brimstone quote ready to roll off his tongue. At first his fellow pupils find his newfound religion a nuisance, as his sermonising on how women should dress leads to the banning of bikinis during swimming class. But as Venya begins to fight the system, he gains the respect of his peers, as teenage rebels so often do. Venya finds some sympathy for his cause in the form of the school's elderly principal (Svetlana Bragarnik) and resident Orthodox priest (Nikolai Roschin), both of whom view the young man as keeping alive old-fashioned values in a world they no longer understand. Though he starts out fighting the system, it's not long before the system begins to meet his demands, with the principal eventually insisting evolution and homosexuality shouldn't be taught as definitive views. This raises the ire of progressive-minded biology teacher Elena (Victoria Isakova), who becomes the last line of defence for truth and intelligence in the school. The Student plays out mostly as a series of confrontations between Venya and Elena, the latter's feminist, atheist, pro-science views making her a representation of everything the former seeks to destroy. That Elena is culturally Jewish doesn't exactly help in their relationship, and it's a weapon Venya uses against her, exploiting the thinly-veiled anti-semitism of her co-workers. Watching the excellent acting duo of Skvortsov and Isakova engage in these heated philosophical debates, shot in extended unbroken takes, is as thrilling as it is frustrating. As also seen in the recent Holocaust denial drama Denial, it can be difficult to back up the truths we seek to defend with evidence, and those who oppose them are always well prepared for a debate. The frustration in Elena's attempts to counteract Venya's outdated beliefs, all backed up with passages from his good book, transfers to the audience. How do you change people's opinions when those opinions are based on unfounded ideas? It's a question we'll need to answer in the coming years if truth, education and intelligence are to survive. Serebrennikov's film may be a thinly veiled Putin allegory, but it's a warning to us all. The Student is in UK cinemas March 3rd.